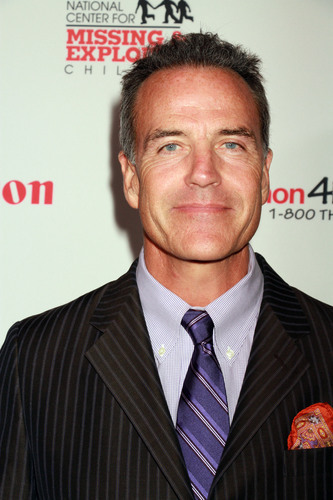 Richard Burgi (ex-Chad, AW; ex-Glenn, ATWT; ex-Randy, OLTL; ex-Phillip, DAYS) debuted on July 8 as Paul Hornsby, father of Dillon (Robert Palmer Watkins) and ex-husband of Tracy (Jane Elliot), a role played by Paul Satterfield from 1991-94. After decades of steady primetime work (DESPERATE HOUSEWIVES, THE SENTINEL), he was drawn back to daytime to stay close to his L.A.-based family (he has two sons and a stepson) and especially by a positive first meeting with GH Executive Producer Frank Valentini. "We had a great conversation," Burgi enthuses. "He liked the idea of me bringing what I can to the part and working with him and the writers to bring out who this fellow might be." Plus, he says, "I've had great experiences in daytime in the past. It’s where I cut my teeth and got my start and I love the sort of boot-camp essence that is the world of daytime. You get to really prepare as much as you can and then execute as cleanly and clearly as possible, because there’s not a lot of fat on the bone in terms of doing it over and over that you're allotted in nighttime or film." His adjustment to GH has been smooth. "It's a lovely group of people and I've been having a great time there." Look for more with Burgi in an upcoming issue of Digest.